Have a recipe that calls for white chocolate baking squares or white chocolate chips, but you don't have any on hand? You may be able to save yourself a trip to the store if you use one of these substitutes in its place. Obviously, if you swap out white chocolate chips for white squares the recipe will retain its white color and original flavor. But if your only option is to replace the white chocolate with milk chocolate, keep in mind the appearance will be quite different and flavor slightly off compared to the original recipe. 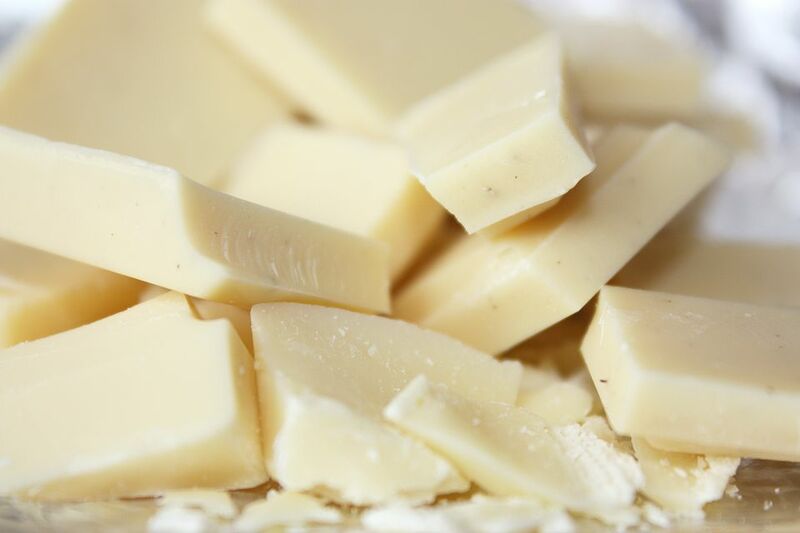 Another form of white chocolate—such as chips or squares—is ideal, but if you don't have any white chocolate you can use milk chocolate (with the understanding the end result will look quite different!). If the recipe calls for white chocolate chips and all you have is white chocolate baking squares, or vice versa, just swap in an equal amount. This will keep the color and flavor of your recipe the same. Chocolate chips often have stabilizers added to them to make them resistant to melting, so they won't melt as easily and smoothly as baking chocolate. This probably doesn't matter if you're making something like brownies but could be an issue if you're making candy or a chocolate sauce where you need your chocolate to melt down to a thin, smooth consistency. Chocolate chips tend to be kind of thick and clumpy when melted. Flip your bag of chocolate chips over, and look at the ingredient list. If vegetable oil is listed as an ingredient, your chips will be resistant to melting. If you don't see vegetable oil on the list, your chips should melt as smoothly as a bar of baking chocolate. Cheap brands of chocolate usually have more filler ingredients and are therefore more resistant to melting. If you don't have any white chocolate in your pantry, replace the white chocolate called for in your recipe with an equal amount of milk chocolate. This will change the color and look of your recipe but will give you the closest flavor match. Like white chocolate, milk chocolate is made from cocoa butter, milk, and sugar. It just has the additional ingredient of cocoa solids, which gives it the brown color. If you are substituting chips for squares or vice versa, you may need to figure out the equivalent measurement. If you have a kitchen scale, weigh your replacement out in ounces. If you don't, use this as a guide: 1 1/4 cups of chocolate chips are roughly the equivalent of an 8-ounce bar of baking chocolate. It may surprise you to learn that white chocolate isn't really chocolate at all. That's because it doesn't contain any cocoa solids. It's made from cocoa butter instead. This is what gives it its white color. In addition to the cocoa butter, white chocolate contains milk and sugar and may contain other sweeteners and flavorings like vanilla.